Nu Boyana Film Studios in partnership with Bulcomp Ltd offers an exciting new opportunity for filmmakers and editors. An AVID Media Composer training course that provides the foundation in mastering Avid Media Composer 6. The training is very hands-on and features project-based lessons ranging from extreme sports real –world project to documentaries and reality shows. Main objectives of the course are introduction to audio and video effects, multicamera editing, trimming, fine-tuning and completion of a finished project. The course will consist of 40 training hours, spread into 4 weeks, and is aimed for beginners, so no previous experience is required from the participants. Important to know is places are limited to 6 people. 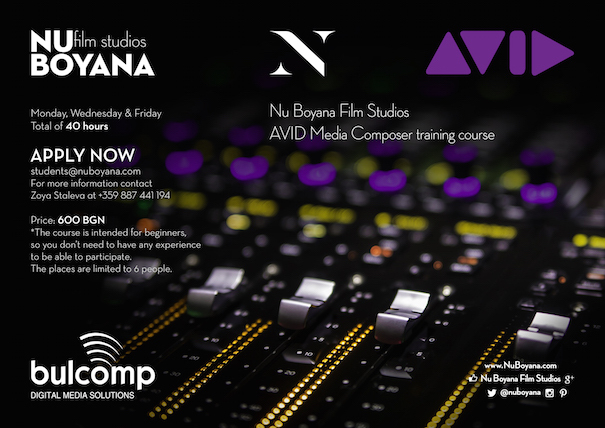 Classes will be held Monday, Wednesday and Friday at the Avid Training Center at Nu Boyana Film Studios. Please send you applications to: students@nuboyana.com. For further information you are welcome to contact Zoya Staleva at +359 887 441 194. The price of the course is 600 BGN. This is the first step in mastering Avid Media Composer 6, the standard editing system used by professionals in the film and television industries. Become part of the Nu Boyana Community and learn the necessary workflows, tools and skills to accelerate your storytelling. Follow us on FB, Twitter and Instagram for more news about Nu Boyana Film Studios!